75146 Star Wars Advent Calendar is a Star Wars set released in 2016. This is a description taken from LEGO.com. Please do not modify it. 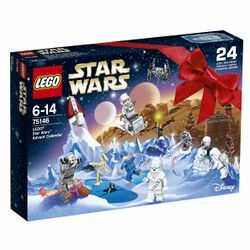 (visit this item's product page) Take a festive tour of the galaxy with the LEGO® Star Wars Advent Calendar. Open up a door each December day to reveal a Star Wars themed minifigure, starship, vehicle or other themed collectible. Once you've collected all 24 gifts, unfold the playmat and create your own epic Hoth, Tatooine, Naboo and space-based adventures. This is the perfect holiday gift for any life form. Includes 8 minifigures plus a Battle Droid. Open a door every day to reveal 24 different LEGO® Star Wars themed gifts. Features 8 minifigures and a Battle Droid, including an exclusive holiday-themed minifigure. Vehicles include Slave I, a TIE Interceptor, AAT, T-16 Skyhopper, Sleigh, Republic Cruiser, Droid Gunship, Jedi Interceptor, Skiff and an Imperial Landing Craft. Weapons include Luke Skywalker's Lightsaber, 2 blaster pistols, 3 blasters and a snowcaster. Also includes a foldout playmat. Collect all the gifts and play out your own Hoth, Tatooine, Naboo and space-based adventures. Makes a great gift for LEGO® Star Wars fans from any galaxy! This set offers an age-appropriate building experience for ages 6-14. Facts about "75146 Star Wars Advent Calendar"